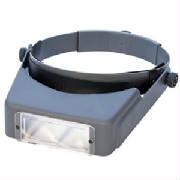 Economical headband magnifier with light. Comes with three coated lenses. Can be worn with glasses. Coated Lenses- Made In U.S.A. 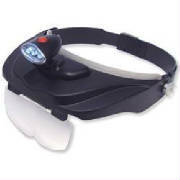 LED jewelers headband magnifier 10x. Two lens powers and a monocular lens. 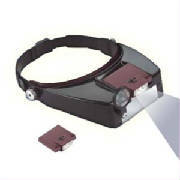 Headband Magnifying glass with light. 4 powers; 1.5x, 2x, 2.5x and 3x. Magnifying Headband with 2 lens powers. Available in three different lens powers. 1.75X, 2.25X, 2.75X. Your choice. Light in weight, easy to wear. For sewing, cross stitch, knitting, needlecrafts. Easy to use head magnifier. Comes with three lens plates. Coated lenses made in USA. Coated Lens Plates For Headband Magnifier. Plates will fit our Sight-Booster visor models. Emits a very bright soft white light. Will fit most headband magnifiers.